In a few months we will join the chorus of well-wishers and collectively sing «Happy birthday, dear Blockchain!». Yes, indeed, on October 31st 2008 Satoshi Nakamoto published his famous white paper describing the Blockchain. So, the Blockchain will officially turn ten this year. Ten years may not sound a lot, but ten years in terms of technological development is a long period. Think of the smart phones being released in 2008: who nowadays uses a BlackBerry Bold, an Apple iPhone 3 or a Sony Ericsson Xperia X1? I mean, apart from my father in law? I assume only few. In terms of distributed ledger technologies, the world has also moved on. But shockingly few know about it. The Blockchain is being used more widely than ever before. Yet, generally speaking, it has largely remained identical to its early stage. It has certainly evolved over time and scalability enhancing measures were taken, such as the bitcoin hard fork resulting in bitcoin cash, and the implementation of the Lightning Network. But apart from these incremental enhancements, it has kept its main features. Some of these attributes, most notably its consensus mechanism, the so-called “proof of work”, and the way it creates immutability of data has turned the Blockchain into an incredibly powerful piece of distributed ledger technology (DLT). Without these two concepts, the Blockchain would not be as successful today as it is. And it would not be as slow. Painfully slow. 3 to 4 transactions per second (tps) slow. In other words, today’s Blockchain is like the good-old Volvo diesel: it is sturdy and safe, but certainly not very comfortable and fast. So, can we have the cake and eat it? Yes, it seems like it. Two new technologies have emerged that are the runners-up for Bitcoin succession: Tangle and Hashgraph. Both promise to yield remedies for Blockchain’s performance bottleneck. Taking the risk of oversimplification, one can say that one fundamental strength of the Blockchain is its sequentiality: one mined block – once approved by the majority of the Blockchain community – builds on another. The next block is put on top and the previous block cannot be altered any longer. This method prevents ramifications, as forks are simply not sustainable in the long run. But this sequentiality also slows downs the block building process immensely. If nature would apply this process, we all would not be existing: building a cell only once another cell has been finished would not yield the necessary efficiency to create living organisms. Instead, nature applies simultaneous cell division. Moreover, nature only passes on those pieces of information to the next cell which is relevant to that very cell. In the case of Blockchain, however, basically, the entire history of all previous cells is passed on to the next one. While Tangle and Hashgraph are also distributed ledger technologies, they are nevertheless fundamentally different to the Blockchain. They are basically Blockchains without the blocks and the chain. The differences are most obvious with regards to information dissemination and consensus reaching. More specifically, Tangle and Hashgraph are “Directed Acyclic Graphs”. In this context the term acyclic is important: these technologies do not require all participants – or network nodes – to be in sync about all information at all times. Instead, they are built around the notion of acyclicity, that is they do not make assumptions about when information reaches which player in a network. Tangle does not use “blocks” in the conventional sense. Instead, if you want to carry out a new transaction on Tangle, you have to approve of two previous transactions. When depicting this in a graph it means that you add a new transaction to the Tangle tip and you are randomly allotted two previous transactions that you need to validate. By doing so the initiator of a new transaction indirectly confirms that a subsection of the Tangle is valid and that it conforms to the protocol rules. It is the Tangle’s “proof of work”. It is important to note that by doing so the Tangle merges the transaction making process with the consensus reaching process. No longer must I initiate a transaction and then wait for the community to approve of it. Moreover, as Tangle applications can achieve consensus without the involvement of any miners, this technology can do away with any transaction fee. Think of your “approval work” as the fee that you pay for your transaction. What is more, the Tangle speeds up the more participants join in. The Tangle technology was well received by the crypto community as it can scale fast, as it is open source and as it is typically implemented as a public distributed ledger. Its flagship application is Iota, a project facilitating the interoperability and sharing of resources on the Internet of Things. Here it currently achieves a speed of up to 800 transactions per second. Hence, similar to the Tesla X, Tangle experts had time to try and test the product lengthily. They enjoyed its speed and agility, but also pointed out some flaws and suggested some enhancements. The Hashgraph uses yet an entirely different method of sharing information and establishing consensus: gossip. If we as humans hear gossip or rumours we often immediately ask questions such as “Who told you that?”, “When did you hear?”, “Who else knows?”, and “How did he/she react, what did he/she say?”. The Hashgraph makes use of similar information sharing and probing techniques: one network participant is obliged to share all its information on transactions with multiple other randomly selected network nodes. The next node will then combine the received information with the information received from other participants and add any information about new transactions. This set of aggregated information will then be passed on to the next randomly chosen nodes until all participants are cognizant of the information created at the beginning. But not only the transaction information itself including a timestamp is passed on, also information about the previous receivers of the information is shared. In other words, Hashgraph not only makes use of gossip but of gossip about gossip. Gossip about gossip also allows for an entirely new consensus mechanism, the so called “virtual voting”. Since every node of the network has a copy of the transaction history along with information on who else has previously received the information every participant can calculate what the other nodes’ reaction of the transaction would be. Hence, every node knows each other’s decision without ever casting a ballot. Hashgraph claims to be incredibly fast: allegedly it can handle more than 250’000 transactions per second. Yet, so far Hashgraph has only been deployed in private settings, that is as a private distributed ledger. If implemented in a public setting Hashgraph may face similar challenges as other public distributed ledger technologies, especially when it comes to security and performance. It, therefore, has not passed a trial by fire test yet. More importantly, however, Hashgraph is not open source, but patented technology. Many details of Hashgraph, therefore, remain unknown to the community of crypto developers and a final judgement on its reliability is hardly possibly. Hashgraph therefore somewhat resembles the new Chinese electric sports car Nio EP9 which is said to be incredibly fast. Yet if you open the hood, you merely see a big plastic cover. In addition, we have no clue how reliable and safe the Nio EP9 technology really is and how it performs on public roads instead of racetracks. The Blockchain is not obsolete yet. Especially in private settings, that is as a private distributed ledger, it has its merits and can be sufficiently fast. In addition, further Blockchain enhancements such as the COMIT network are in the pipeline and may help to further improve its performance and application scope. What is more, however, is that the Blockchain’s most important characteristics will prevail: decentralization and data immutability. Today many people equate distributed ledger technology with the Blockchain, just as they use certain brand names such as Jacuzzi, Scotch Tape and Frisbee to label product ranges from various manufacturers. But as time passes new entrants will step into the cryptography market and provide novel solutions. 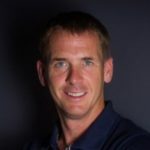 People have understood over time that automobile does not necessarily equate with Ford and today consumers can choose among additional brands such as Volvo, Tesla and Nio. In the future people will also learn to differentiate among various distributed ledger technologies. But as in the automobile industry, the next evolutionary leap of the crypto world is lurking just around the corner: the Holochain. 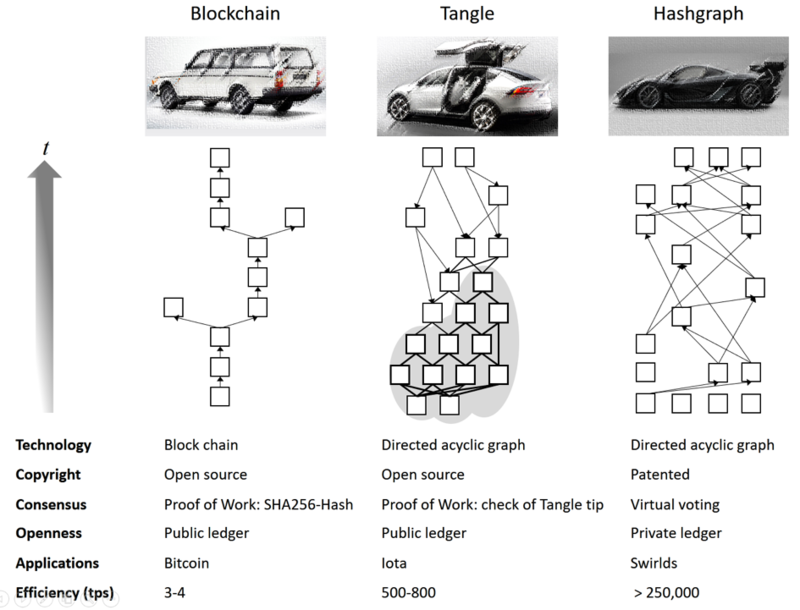 If the Blockchhain, Tangle and Hashgraph represent individual cars, think of the Holochain as a technology creating ecosystems of distributed ledgers. The Holochain will be the Uber of distributed ledgers. But this will be the topic of another article.